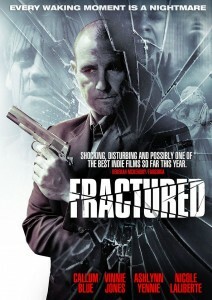 Seven Arts is prepping the release of Fractured, the thriller formerly known as Schism. Adam Gierasch of the Night of the Demons remake and Fertile Ground directs. Vinnie Jones, Callum Blue, Ashlynn Yennie (The Human Centipede) and Nicole LaLiberte (Dexter) star. Blue plays Dylan White, a cook in Baton Rouge with a normal, boring life. Then horrifying visions start to interrupt his waking moments, and he must face the fact that he literally doesn't know who he is. Following clues that take him to the dark underbelly of New Orleans, Dylan soon finds both his life and soul in danger. The film made its debut at Screamfest in Los Angeles last year. Head to the Facebook page for more, including a few images!